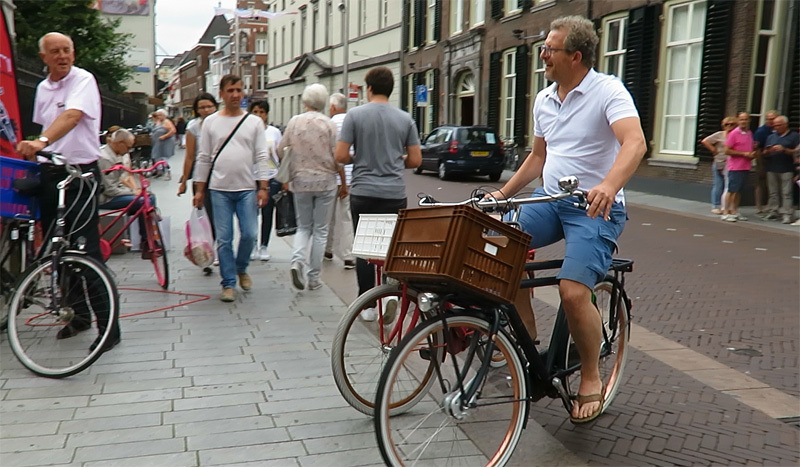 Loud cheers and applause could be heard near the ʼs-Hertogenbosch cathedral last Saturday, every time someone arrived pushing a second bicycle. Clearly, that second bicycle was going to be donated to charity! Riding while pushing a second bicycle is not a problem for a lot of Dutch people. That made it possible to bring the bikes by bike! The garden of the cathedral served as a collecting point for used bicycles for refugees. The bicycles are meant for the 250 refugees currently living in a shelter in the municipality of ʼs-Hertogenbosch. Refugees who had to leave their homes in Eritrea and Syria, among other countries. 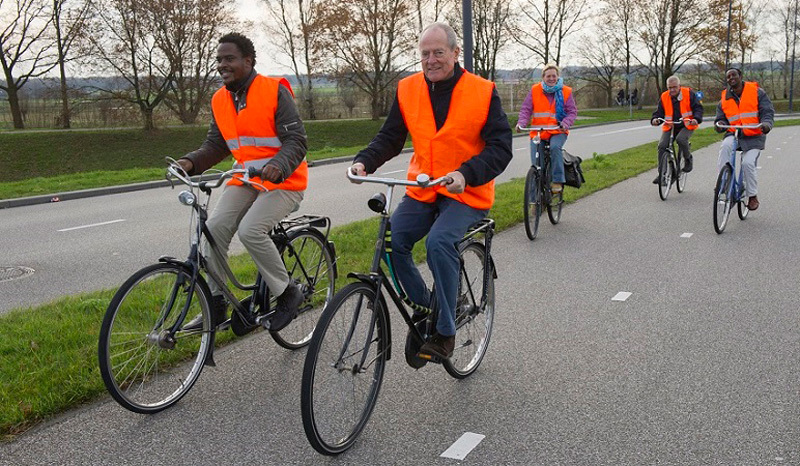 Investigations show that learning how to ride a bicycle is in the top 5 of best ways to integrate in Dutch society. That is why the organisation MIVA set up this bicycle collecting project. The refugees will be taught how to ride the bicycles and this learning is a language course at the same time. 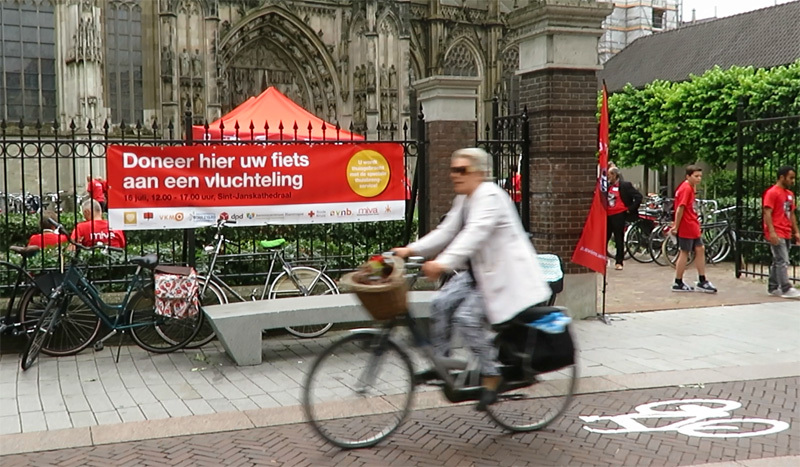 “Donate your bicycle to a refugee here” read the banner that was attached to the fence of the cathedral in ʼs-Hertogenbosch on Saturday 16th July 2016. MIVA is an over 80-year-old Dutch charity organisation with roots in the catholic missionary tradition. (Which explains the location of the bicycle collecting project.) Nowadays, the main object of MIVA is to provide people in developing countries with means of transport and communication. This enables those people – in turn – to improve the living conditions of vulnerable groups of people in their society. I was told MIVA doesn’t normally work in the Netherlands, but this project felt like staying close to their core business: emancipating people by providing them with their own means of transport. The donated bicycles were inspected right away and most were found to be in a really good condition. The teaching part of this project is in the capable hands of the volunteers of “Wij gaan fietsen/Yalla Biskleet” (We are going to ride a bicycle). The refugees are being taught how to ride in 4 lessons of 1 and a half hours. 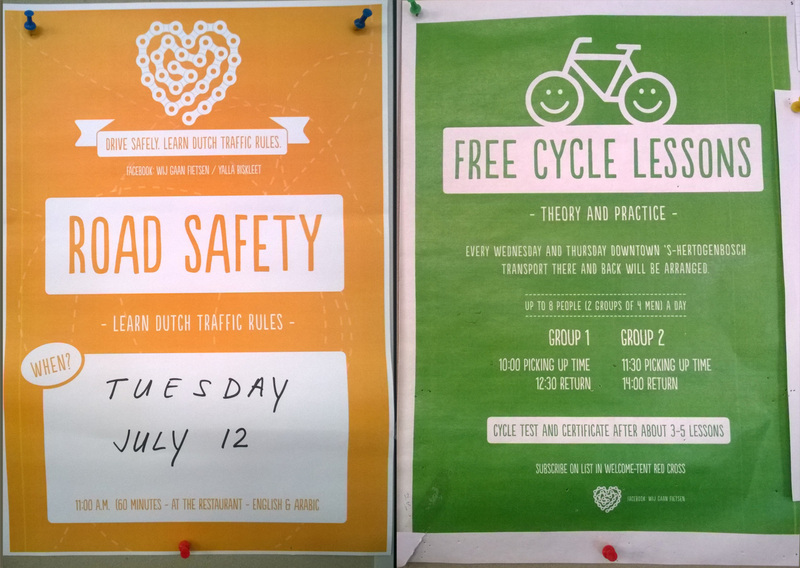 After this course they take a test and if they pass, they are given a certificate and their own bicycle. On their Facebook page Wij gaan fietsen/Yalla Biskleet reported that in the end over 100 bicycles were donated at the event in ʼs-Hertogenbosch, but dozens more have been promised to be handed over later. This means that (former) chaplain Patrick Kuis needs to cook! He promised to cook a three course meal for the person making the 100th donation! One of the local bicycle shops (who’s co-owner I interviewed for this blog some time ago) was also involved in this heart-warming charity event. A personal message to the future owner of this bicycle: “Won in a lottery. This prize is for you ‘we are going to ride a bicycle’! Greetings, Annelies”. At the end of an afternoon of collecting bicycles, volunteers, many of whom are refugees themselves, brought all the bicycles into the century old cathedral. Seeing that many bicycles in the cathedral was an exceptional sight. The tourists and visitors of an organ concert who stumbled upon the bicycles watched them in surprise. Quite a few people were also very interested in the personal messages that the previous owners had written for the future owner of the bicycle. Most were good luck wishes, but one person had written that she had won the bicycle in a lottery. She felt this brand new bike would be better in place with a refugee. 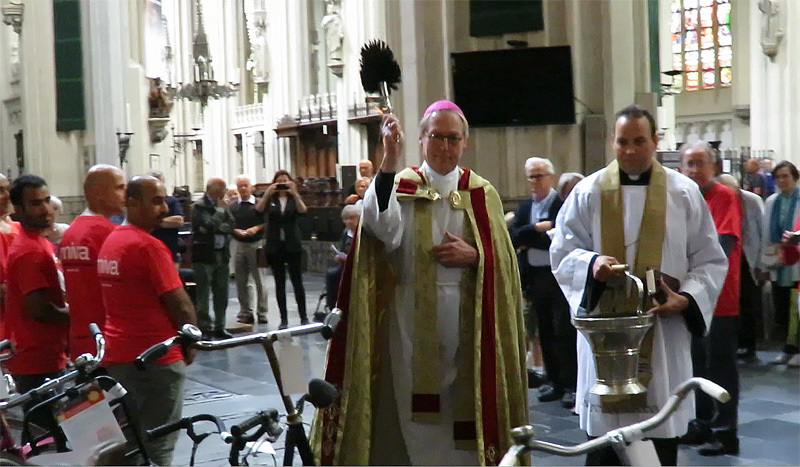 Bishop de Korte blessing the bicycles in the cathedral of ʼs-Hertogenbosch. He was assisted by (former) chaplain Patrick Kuis. 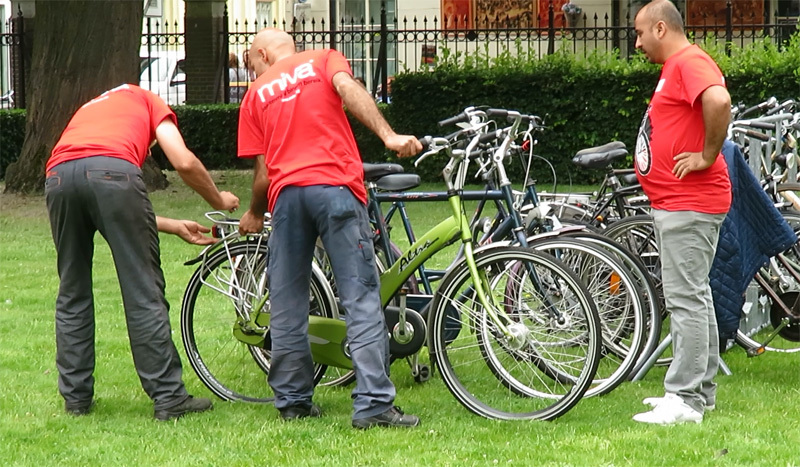 This week’s video shows the bicycle collecting project for the ʼs-Hertogenbosch refugees. Hello from Scotland. I am the founder of Bikes for Refugees (Scotland) and wanted to say hello from one refugee bike project to another. Perhaps we could arrange an exchange sometime. We are based in Edinburgh and set up about 15months ago and have since repaired and distributed 230 bikes free to refugees and asylum seekers. This was just an article on my blog. The facebook site of the actual organisation behind this project is here. fantastic project. The refugees don’t have to be religiously indoctrinated as part of the deal, do they? No. Actually, religious people make up a minority of the Netherlands these days. Not that you aren’t free to chose some other faith, the Dutch really don’t care much as long as you don’t make others do what you do. Also, it would be a very Christian thing to do if you were to donate a bicycle to someone in need, the Good Samaritan was in the Bible presumably someone of a different religion than the robbed and stripped man on the roadside. Nice initiative. Unfortunately now your youtube channel is overrun by haters but they’ll lose interest quickly I hope. A good initiative to intergrate refugees in Dutch society by making them mobile. This entry was posted on 19 July 2016 by Bicycle Dutch in Video post and tagged ’s-Hertogenbosch (Den Bosch), small things.